Bats tend to scratch on the walls or ceilings as they lurk throughout the inside of your home. You also might hear chirping or squeaking as the bats communicate with each other. Looking at the outside of your home, typically towards the peak of the roof (but not always), there will be dark spots where bats enter and exit. Bats can squeeze into very small holes which will leave a dark stain on the siding or brick that is generated from the oily fur of bats. Common areas to look include the siding at roof peaks, gables, soffits, vents, and flashing. 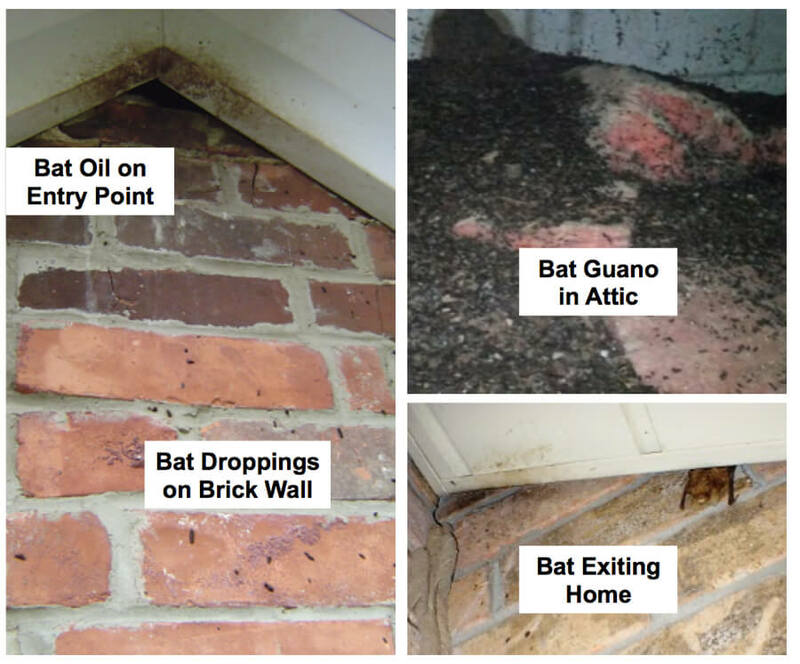 If your property is infested with bats, you might notice bat droppings, also known as guano. Bat droppings are commonly found on the side of your house, at the bottom of an entry point (window sill, porch, ground), and in the attic. You’ll often find a pile of guano on the insulation in your attic underneath their perch. Bat Guano has a strong smell of ammonia. If you notice a strong odor in an area of your home, this could be another sign. You might already know that bats are nocturnal mammals and you won’t catch them flying around during the day in the bright sun. But if you see bats flying around your house or barn at sunset or sunrise, this could be an indication that they are leaving their roost or going back to it. Bats leave their roost at night to feed, and come back early morning for the day. 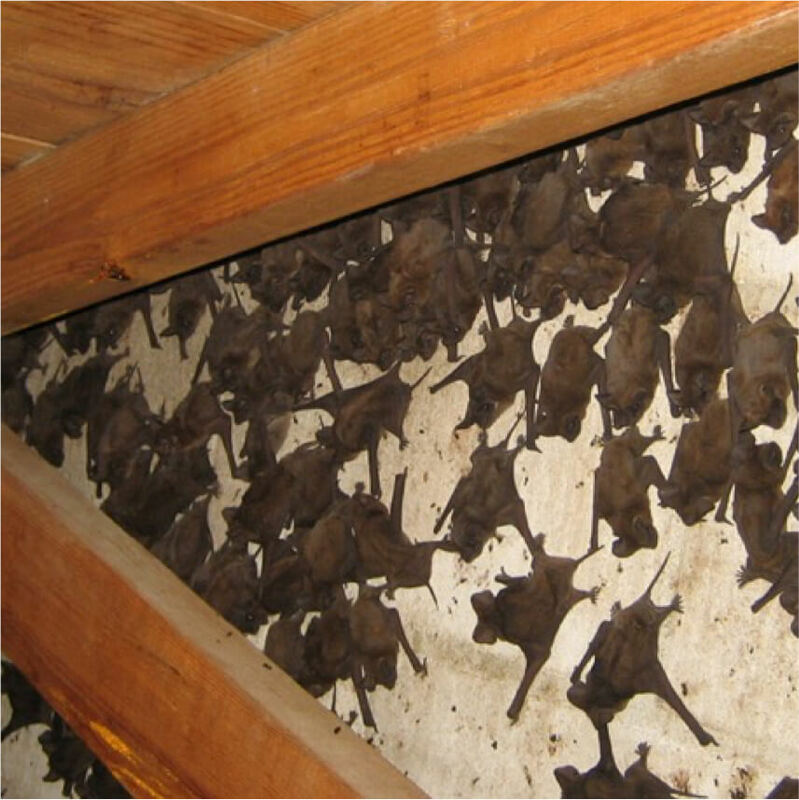 You Have a Bat Infestation…Now What? First of all, bats do not typically hang out solo. When you see one, there’s typically many more. If you notice any of these signs of bats, it’s likely not from one or two, but a colony. If you have a bat issue, it is highly recommended that you hire a professional bat removal company to inspect your property. 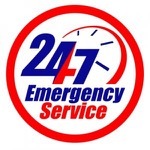 Bat removal & control should only be performed by a licensed professional with training and experience. Not only can a professional safely and effectively remove bats from your home, they can also control the situation and seal up the entry points so that the bats do not re-enter your home.